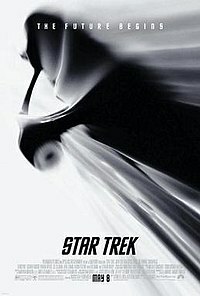 If you aren’t sure where this new Star Trek film finds itself in the vast Star Trek universe, this movie is a re-boot. This movie actually opens before James Tiberion Kirk was born. The movie revolves around the “original” Star Trek characters. Kirk, Spock, Scotty, Uhura, Bones, Sulu and Chekov are all there. These characters are iconic in American TV history. The original TV series only aired for three short seasons, but syndication and then a string of feature films have kept this series alive for 40 years. Yes, that is correct. Star Trek originally aired from 1966 to 1969. This show went off the air 40 years ago this year, but its still on TV! I had to really sit down and put 40 years into perspective. When Star Trek was finished on TV my parents were both minors. Yet these shows are still airing in re-runs today! The casting for this movie had to be done correctly. EVERYONE knows Kirk, Spock, Scotty and Uhura. The smallest differences and character decisions by these actors will be dissected by the “fanboys.” Not too proud to admit, I’m one of those fanboys. The casting is perfect. Each actor brings something to these characters. The performances made my inner Trekkie smile. We’ll start with James Tiberius Kirk (yes, the character has it’s OWN Wikipedia page!). Chris Pine gets the call to play the storied lead and Captain of the U.S. Enterprise. To be honest, I had never heard of Chris Pine before, but he plays the womanizing, rule stretching somewhat troubled captain amazingly well. He doesn’t simulate the Shatner speech pattern (thank God) but he is a very believable Jim Kirk. Spock is played by Zachary Quinto (of Heroes fame) AND Leonard Nimoy returns in the role. This isn’t a spoiler because they’ve shown him in the previews. Quinto did an amazing job at portraying the emotion of the nearly emotionless half Vulcan. Ben Cross plays Sarek (Spock’s dad) and Winona Ryder plays Amanda Grayson (Spock’s mother). Nyota Uhura is played by Zoe Saldana, another actress I don’t recognize. Luckily Wikipedia was nice enough to remind me that she had a role in one of the recent Pirates of The Caribbean movies. She plays the expert communications officer and first is seen in a bar with on Jim Kirk attempting to pick her up. Reminded me instantly of the first interracial kiss on television by Kirk and Uhura in the original series! Montgomery “Scotty” Scott is played by a favorite of mine, Simon Pegg. Pegg is famous for his starring roles in Shaun of the Dead and Hot Fuzz (both classics in my mind). He is a British actor who channeled his in-laws for his Scottish accent. I personally think he did an amazing job at honoring the original Scotty and making it his own. There is some lame chatter on the internet that he chose the wrong Scottish accent, but I couldn’t tell the difference. Scotty shows up late in this movie, but completely steals a couple scenes with the comedic timing. Hikaru Sulu is played by John Cho (of Harold & Kumar fame). In this film Sulu has a few very funny lines/situations but is mainly a secondary character. I think that Cho did a very good job as Sulu, but of the main characters, he had the least major lines. But some would say this was also the case for the original series. The movie’s bad guy is the Romulan Nero and is played by Eric Bana. I have decided to tell very little about the plot of this movie, and Nero’s entire character would give away a major portion of the plot so all I can say is that he is a very troubled Romulan who wishes revenge against Spock and The Federation. As an ensemble the cast is amazing. It really is a great collection of actors that have come together to recreate the franchise. Tyler Perry makes a small appearance at Starfleet Acadamy and Randy Pausch has a single line in his appearance. Randy Pausch is famous for his “last lecture” after learning that he was dying. He passed away last year and was honored with a memorial inside The Magic Kingdom (near the Mad Tea Party). The CGI is amazingly awe inspiring and realistic at the same time. I’m not sure even I can explain it, but it was good. The costumes are great, Tara especially loved Spock’s winter coat. The pacing of the movie is spectacular. It is over two full hours long, but doesn’t feel it at all! Go see the movie! NOW! It is playing everywhere and is just a great movie. Trekkie or not, it doesn’t matter. That is part of the genius, this movie is a great re-boot of the franchise for new comers and old timers alike. There are so many little things that they did right to honor the original franchise but also took it to a whole other level. Im a huge fan of Simon Pegg and thought I was the only one! Having been faithfully glued to my black and white TV in the 60’s, I was thrilled with how well this movie was written and cast. This is the best movie I have seen in a long time. As a fan of 40 years I hope all the true followers go see this movie. I know the previous movies have been dogs, except Khan, This movie is not even in the same universe. I went on your suggestion and actually loved it. Despite a loathing of all things stars (star wars, star trek). Thank you!